I always love bookmail; a combination of books and snail mail is a dream. So, when ‘The Dry’ turned up thanks to my Auntie, I was excited. I had heard of ‘The Dry’ but was not really sure what it was about, however when I realised it was a thriller, I may have picked it up sooner. The atmosphere jumps out of the book from the moment that you start reading. You can immediately sense ‘The Dry’ and the impact that it has on the people of the small Australian town. It also adds to the thrill of the read, as it almost gives each character an additional edge as they deal with the past, present and uncertain future. So much of the tension comes from the environment that it is all taking place in, especially at the thrilling conclusion. It can be hard to review a thriller without revealing spoilers. All I will say about the plot is that Aaron Falk is a character that you have sympathy for, as his story, past and present, unfolds with each page. There are two mysteries all the way through the novel: who killed the Hadler family? And is it connected to an unsolved death many years before? The present-day crime certainly stirs some ghosts from the past and it does not take long for the people to be pushed to the limit. This novel certainly has you wanting to know what happens next. It is quite a debut from Jane Harper; I hope we see many more stories from her pen. Have you read any great debut novels? What would you recommend? One think I love about Autumn (although there are many) is that so many wonderful books are published. 2017 has meant a new Marian Keyes novel and I was counting down until it was published. I was not disappointed when I picked this book up – immediately I was drawn into the ‘adventure’ all the characters were about to embark on. It is a fascinating study of all sorts of relationships. This tale is not just about ‘The Break’ and the impact that it has on Hugh and Amy at the centre of the story, but the many ripples that come from it and impact other characters. There is, also, a clever reflection of how life carries on for everyone, despite what other events may be taking place. For me, the inner strength that so many of the characters found in tough times was inspiring and, in fact, ‘The Break’ did not just apply to Amy and Hugh and what they went through, but also the desire that others may have to find a ‘break’ from the lives they’re living. As always Marian Keyes handles all the issues she tackles with humour and warmth. She manages to empathise with so many experiences that her readers may be facing and it always seems to be like you are reading about friends and not strangers. As I read this novel, I laughed, I cried (just a little) and I never wanted to put it down. I have to thank my lovely friend Erin Green for introducing me to the novels of Marian Keyes one World Book Night a few years ago, because, since then, she has become one of my favourite authors. Have you ever read any novels by Marian Keyes? Do you have a favourite? I always look forward to my trips to the RSC. It is a tradition to attend with my mum, dad and Mr BookwormandTheatreMouse, and knowing we were off to see Coriolanus added huge excitement. My Mum studied Coriolanus at A-Level (a little while ago…hehe) and she had been going on and on about wanting to see it again, so I was keen to see why this play had captured her imagination. We were all hooked from the moment that it began; as always, the action was immediate. And, with war as a central theme, there was a wonderfully choreographed fight scene between Coriolanus and Aufidius early on. However, their enthusiasm did seem to be a little too much, because after quite some encounter with the shutters, that formed a key part of the scenery, they no longer worked. This technical hitch did not spoil anyone’s enjoyment; in fact, after the slight interlude, the cast managed to make quite a joke of the situation as they returned to the stage and acted as though nothing had happened. All seemed well as the tale continued and the power struggles developed, until in a moment of total darkness there was quite a crash as the shutters stopped the play again. I only mention this because of the amazing spirit of the cast, crew and RSC staff as they proved that the show must go on. All of this, in fact, led to us having an exclusive performance – as in it became a shutter-less performance. This did not remove from the story or the action at all; you would not have known that the shutters were missing, other than that it was a missing element of the industrial setting. The play was one that had a clear theme of war and the struggle for power. Coriolanus has clearly been brought up to be a fighting machine, but the desire for power from the people around him exposes some of his weaknesses. This leads to an alliance that eventually ends in tragedy. Sope Dirisu led the cast wonderfully in this production and really finds his stride as the play develops. As you would expect from an RSC production, the whole cast gel together to bring the story to life for the audience. I think that this is a hidden gem in the Shakespeare collection and I am so glad that my dad is determined to collect a whole set to keep us all visiting the RSC. Now, you should not judge a book by its cover, but this book has one of the most beautiful and intriguing covers I have ever seen. So, when it was the Waterstones children’s book of the month last month, I had to read it. From page one, I was hooked; I knew it was going to be an adventure that I wanted to be part of. From the moment Violet and her family arrive at Perfect, there is a sense that it may not live up to its name. The rose-tinted view that all the residents have thanks to glasses that they all wear simply does not seem to be shared by Violet (she was perfectly happy with the life she had), especially after her father disappears. Once she meets Boy, the adventures really pick up pace as they work to prove that things do not need to be ‘perfect’ to be exactly what they need. It is a tale that proves that a little love for family, and determination, can defeat evil. This reminded me of the classic tales of authors like Neil Gaiman. A good collection of characters, some we like and some we don’t, but ultimately a tale that stays with you a long time after you read the last word. After all, do we really want everything to be perfect? So, we have returned to the routine like we never left it. After 6 wonderful weeks off, week one of the day job has been completed. This has left me reflecting on the adventures of the summer. Our big adventure was 5 days in Guernsey. The reason we went to Guernsey was simply because I had read ‘The Guernsey Literary and Potato Peel Society’ and I wanted to see if was as wonderful as the novel made it seem. This is the capital of Guernsey, a port town. It is a charming, historical town. So beautiful with wonderful architecture and cobbled streets. The views out over the harbour are stunning. For a capital is has a very relaxed vibe (although it is slightly hectic if the cruise ships come in). You easily find yourself wandering round, not noticing the time pass. Only a few paces up the hill you easily leave the hustle and bustle of St Peter Port and it is still all so beautiful. As you walk behind the city in a north east direction you find a part of the town with a very French style and atmosphere, to the north west you come across glorious gardens that could be in the English countryside. As capitals go – it is an adventure. I LOVE castles; a sniff of history and I am in my element (another reason Guernsey is glorious) and Cornet Castle oozes it! You can do all the attractions at the castle in any order you like but we started with the story if the castle, short, sharp facts of its colourful history. Perfect to ensure we were out in time to see the firing of the Noonday gun. This was very History geeks dream, the men come out in period army uniforms, check and fire the gun. OH MY WORD, does it make you jump (I doubt anyone has a successful photo of the event), even though you know it is coming it always seems worse but it is worth it for the electric atmosphere of feeling like they are experiencing a historic tradition. We then made our way round the other museums housed in the castle and explore the grounds. The views of Guernsey you can get from different parts of the castle are stunning. You spend hours exploring and learning so much history about the colourful castle. This is certainly one of the gems in the Guernsey crown. A huge part of the charm of Guernsey is that you can so easily get round the island on the bus. So, we caught the bus a little further inland to allow us to explore the German underground hospital from the occupation during World War Two and follow that with a gentle stroll to the Little Chapel (in the rain). The underground hospital is simply a route of tunnels but the atmosphere in unbelievable (especially on a very rainy day). As soon as you hear one echoing sound it sets your imagination firing about what it would have been when it was in full use. The two gentlemen who work there (and count you in and count you out again) are very knowledgeable and willing to share their vast knowledge of the occupation with the visitors. The Little Chapel is a short walk from the underground hospital. It is stunning! Inspired by the grotto of Our Lady of Lourdes at Massabielle (a small market town in the foothills of the Pyrenees). The chapel has been rebuilt on a number of occasions, always by Brother Deodat (although he never saw the final version), and the chapel as it stands today was started in 1923 and decorated with pebbles and pieces of broken china as other materials were scarce. In 2016 The Little Chapel Foundation was established to work to preserve the chapel as little had been done for it several years. You can not visit Guernsey without visiting this chapel. Guernsey is an island that is perfect for a book and theatre lover because this is the island that Victor Hugo spent his exile AND finished ‘Les Miserables’. Nestled to the north east of St Peter Port is a rather imposing white house that flies French flag – Hauteville, the home of Victor Hugo and owned by France. You do have to book onto a tour in the language of your choice so you need to be flexible (we went for another beautiful walk while we waited for our tour). I can not out into words the interior of Hugo’s house you would have to see it for yourself (in some sense to believe it). However, the tour of the house is fascinating, the snippets the guides share are fascinating and I think you will leave with a desire to read Hugo’s books. (Especially when you see the EXACT spot he finished Les Miserables). So, Guernsey is glorious. The food is fantastic. The views are stunning. The walks are wonderful. The people are friendly. You really need to visit! Have you ever visited the Channel Islands? What did you think? I am a HUGE Goth Girl fan and when I spotted a copy of The Sinister Symphony in Waterstones when I needed an emergency book for a train journey, I was so excited and had to purchase it immediately. Reuniting with Ada Goth and her pals is liking meeting with old and new friends. I am far older than the target audience of this book, but the charm of Chris Riddell’s creations is that the humour works on so many levels. He certainly writes jokes in there for the older readers as much as he does for the target audience. (I may have caught myself laughing out loud at points and that can be a little embarrassing as you sit on a busy train from London.) There are wonderful little comments on society and clever plays on words throughout, which are nods to the world we live in and some of the characters from popular culture. Ada’s latest adventure takes place at a music festival organised by Lord Goth in the grounds of Ghastly-Gorm Hall. There are the usual giggles along the way as Ada tries to keep all her plans for her father and his future happiness on the right path. There was real happiness for me in this tale as there were nods to Narnia (and a surprise addition at the back of the book), which is one my favourite books from my childhood. As usual, the book is beautifully presented with Chris Riddell’s stunning illustrations throughout, which bring each character to life for the reader. I was smiling a bit like a fool as I turned each page, as you can not help but be cheered by what you see on each page. I am so pleased that I can add this to my collection of Goth Girl books and urge you all, young and old, to go on an adventure with Ada and The Attic Club – you will not regret it. Wonder Woman has been BIG in 2017, in fact it has been quite a year for Girl Power as a whole. So, that makes Diana the perfect character to launch Penguin’s collaboration with DC to bring 4 of their most iconic characters to a new generation of YA readers. For me, this novel was a little slow to get started with a lot of scene-setting. Although, as there is the aim to hook a whole new generation then they need the background to give them the context of the wonderful Wonder Woman. Once the pace of the novel picked up, it was a thrilling read. It is action-packed once the story is established. There are well-crafted nods to Greek mythology (as you would expect) and it spiked my interest in that fascinating era. The thing for me which really stood out in this story were the incredibly strong female characters. Wonder Woman aside (as we all know what a star she is) but also the two other key female leads. Alia, has struggles of all kinds as she has grown up as part of an important family but she knows her own mind and has a true sense of responsibility (especially once she is aware of the secret she did not know she held). Her best friend, Nim, is another girl who for different reasons has not always found it easy. She is an openly gay character but it is clear that, despite her outward confidence among her friends, there is a cultural struggle for her. It is great to read a novel of such fantasy having such real characters who can really bring such modern issues to readers. This is similar to the theme of the novel – war. It is such a current story (and sadly, one that won’t date) that has certainly picked out some of the biggest issues of the twenty-first century. Maybe even some of the fears of the people who are reading the book. Overall, a clever concept that will bring a whole new generation to Wonder Woman. Wow – what a combination – Atwood and Shakespeare. One, as you will know, I have been a fan of for a very long time, and one I only discovered this year when I read the ‘The Handmaid’s Tale’. For me – and I suspect it is open to interpretation – Hag-Seed is not a simple retelling of The Tempest. It seems to be so much more than that. In fact, believe it is that clever technique of a play within a play. A technique that Shakespeare himself was a fan of. You begin thinking that Felix just wants his revenge for losing his job, and possibly the loss of his wife and daughter, BUT you end through subtle hints wondering if he in fact believes he is the great sorcerer Propspero. However, throughout his antics does he become more like Caliban than he cares to admit or aware enough to realise? I do not want to walk you through the novel because that will spoil the enjoyment for anyone who wants to pick it up (go on, you know you want to!). All I will say is it has all of Atwood’s skill for storytelling, and she does make the tale her own. You do not need to be a fan of the Bard to pick this novel up – it is almost irrelevant with the dark, humourous storytelling that Margaret Atwood has offered. So, are there any retellings (of anything, by anyone) you think I should try? Last week was my birthday, and the only way that a Bookworm and Theatre Mouse wants to spend their birthday is at the theatre. 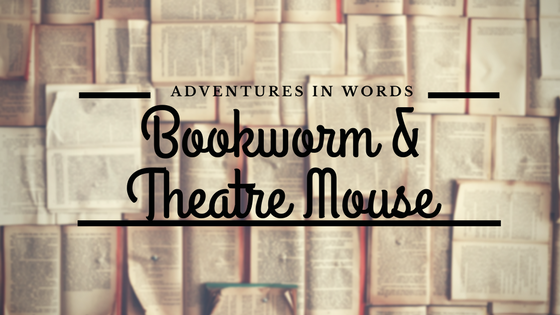 I was lucky that Mr Bookworm and Theatre Mouse seemed to agree and, even more surprisingly, he agreed to a musical (slightly strange) – and then I discovered why: he had booked us tickets for The Book of Mormon at the Prince of Wales Theatre in London. Now, my thoughts (as echoed by a few of my friends) was that this was something that he wanted to see and may not be my cup of tea. Oh, how we were all wrong; I loved it, the way that I loved Avenue Q – it was a musical for adults. From the moment the first note was struck, the audience seemed to be giggling and it did not take long for this to become almost hysterical laughter from some, including me at points. This musical is a friendly and harmless ribbing of the Mormon faith. It is all done in good humour from the writers of South Park. The comedy comes from the script, the songs and the excellent comedy timing of all the actors on the stage. The best laughs all seemed to be thanks to Elder Cunningham – his comic timing and sheer enthusiasm brought so much enjoyment to everyone, even those on the stage with him. However, the ensemble as a whole made the full experience thoroughly enjoyable (even if you did catch yourself laughing at things that you are not entirely sure you should be). There are, of course, some clever comments on the society that we live in throughout the play, all done in good humour, but it does leave you thinking about the world that we are in and maybe some of our actions. Although, before I arrived, I had no real idea about what to expect, I left humming the tunes and find myself reliving moments and having a bit of a giggle. Not always at the most appropriate times, but it is the sign of an excellent show if you are still thinking about it a long time after the curtain has dropped. There was a standing ovation for this production and it was well deserved – it really was a piece of very happy escapism from the ever-so-slightly-crazy world we live in.